Senior AIADMK leader and Fisheries Minister D Jayakumar, when asked if the mood of the people would reflect in the 2019 Parliamentary polls, said the electoral scenario could change. 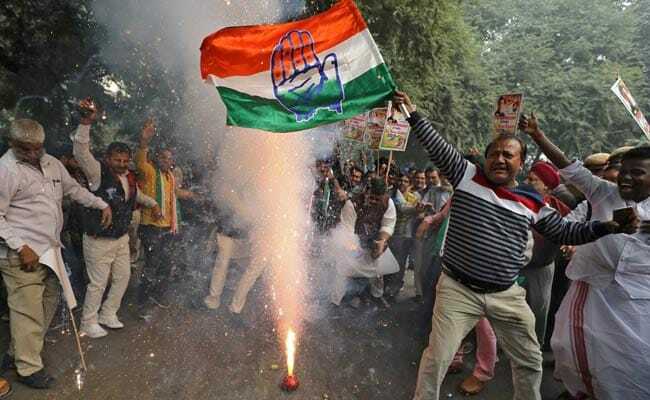 Congress workers celebrate after party heads towards victory in Rajasthan and Chattisgarh. The ruling AIADMK today said the mood of the people for the Parliamentary election next year cannot be judged based on the poll outcome in the five states, while main opposition DMK lauded the Congress for its good show. "The situation keeps changing," he said adding that the mood of the people cannot be fully gauged based on the results of the five states. "These are state Assembly polls. Nobody can predict the mood of the people for Parliamentary polls... the heart of the people is like a deep mine," he said. DMK President MK Stalin in a tweet, said "I congratulate Thiru @RahulGandhi and the @INCIndia party for the excellent performance in Chhattisgarh, Rajasthan and MP." The leader of opposition said the results would "reinforce our fight against the fascist BJP regime and help in strengthening the grand alliance. #Results2018." "People have proven that democracy is strong," MDMK chief Vaiko said. CPI(M) State Secretary K Balakrishnan said that the results were a prelude to the Parliamentary election.